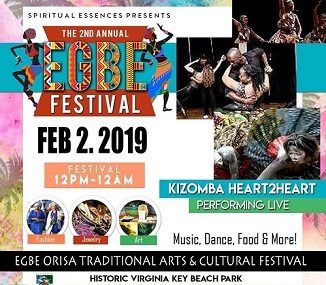 The second annual Egbe Festival offers festival-goers various performances, foods and vendors from throughout the African diaspora at the Historic Virginia Key Beach Park on the second day of African-American History Month. On Saturday, February 2, 2019, the organization Spiritual Essences brings together participants like the Atlanta-based jewelry designer from the blockbuster film Black Panther and the African masquerade group, premiering for the first time in the U.S. to awaken the South Florida community to African contributions in the Americas. At one time a “colored people” beach, Virginia Key Beach in South Miami-Dade is the perfect backdrop for Egbe’s live drumming sessions, Afro-dancing, arts and crafts and seaside family fun. Performers from South Florida’s Kizomba Heart2Heart will debut their Angolan partner dance, kizomba, for the first time at this year’s festival. It is a dance craze that his grown popular in the U.S. over the past decade due to a melding of Angolan semba dance and French Caribbean zouk music.